1University of Tunis El-Manar, Faculty of Sciences of Tunis, University Campus 2092 El-Manar, Tunis, Tunisia. "Corresponding author (dhia_bouktila2000@yahoo.fr). The tomato leaf miner Tuta absoluta Meyrick has invaded tomato (Solanum lycopersicum L.) crop in Tunisia since 2008 and is representing today a major threat to the production of this crop. In this study, we used the Randomly Amplified Polymorphic DNA-Polymerase Chain Reaction (RAPD-PCR) technology to assess the genetic variability within and among seven populations of T. absoluta, collected on tomato from different regions in Tunisia. Using five RAPD-PCR primers and 108 individuals, 140 polymorphic fragments were recorded. From 335 different RAPD phenotypes generated, 71 were redundant and 264 unique to a specific population. The genetic structure of T. absoluta was investigated using analysis of molecular variance (AMOVA), genetic distances (Fst) and multidimensional scaling (MDS). We detected a high genetic diversity within and among populations in conjunction with a significant differentiation between populations, suggesting that different founder genotypes would have been responsible of the introduction of T. absoluta in Tunisia. The presence of overlapping phenotypes probably indicates migration events between populations, mainly through infested plant material carried by humans. Key words: Invasive species, molecular markers, insect populations, gene flow. El minador de hojas de tomate Tuta absoluta Meyrick ha invadido el cultivo del tomate (Solanum lycopersicum L.) en Túnez desde 2008 y actualmente representa una importante amenaza para su producción. En este estudio usamos la tecnología de ADN polimórfico amplificado al azar-reacción de cadena polimerasa (RAPD-PCR) para evaluar la variabilidad genética dentro y entre siete poblaciones de T. absoluta, colectadas desde tomate en diferentes regiones de Túnez. Usando cinco primers RAPD-PCR y 108 individuos, se registraron 140 fragmentos polimórficos. Se generaron 335 fenotipos RAPD diferentes, entre los cuales 71 fueron redundantes y 264 únicos para una población específica. La estructura genética de T. absoluta se investigó usando análisis de varianza molecular (AMOVA), distancias genéticas (Fst) y escalamiento multidimensional (MDS). Detectamos una alta diversidad genética dentro y entre poblaciones en conjunto con una diferenciación significativa entre poblaciones, sugiriendo que los genotipos fundadores podrían haber sido responsables de la introducción de T. absoluta en Túnez. La presencia de fenotipos superpuestos probablemente indica eventos de migración entre poblaciones, principalmente a través de material vegetal infestado transportado por humanos. Palabras clave: especies invasivas, marcadores moleculares, población de insectos, flujo de genes. The level of genetic diversity in introduced populations of an invasive species is considered as a major factor influencing its survival and adaptation capacities (Sakai et al., 2001). The introduction processes can be explained by two hypotheses with respect to their expected consequences on genetic diversity. (i) A single introduction event from a single native population. Many biological invasions belong to this category (Lee, 2002); in this case, the introduced population is small and a strong loss of genetic variability can be detected in the invasive species, depending on the extent and duration of the bottleneck introduction process (Taylor et al., 2004). (ii) Several introduction events from several populations. Even if each introduced population contains only a part of the genetic diversity of the species in its area of origin, the mixture of those populations may result in a high level of diversity in the introduced population (Genton et al., 2005). Given this relationship between the genetic diversity and invasion process for a species, it is necessary not only to know its level of genetic variability in both native and invaded range, but also study its biology and the history of the invasion (Puillandre et al., 2008). The tomato leaf miner (TLM), Tuta absoluta Meyrick (Lepidoptera: Gelechiidae), is one of the most devastating pests native to South America (Garcia and Espul, 1982; Rodriguez et al., 2006). Since the first detection of this pest in Spain in 2006, it has been spreading rapidly through the Mediterranean basin, causing a very high level of damage to tomato (Solanum lycopersicum L.) crops. Its primary host plant is tomato. Yet; potato (S. tuberosum L.), pepper (Capsicum sp. L.), eggplant (S. melongena L.), and various wild solanaceous plants are also suitable hosts (Siqueira et al., 2000). Damage is caused by all larval instars. These larvae mine leaves, producing large galleries on their surface, feed on mesophyll tissues and burrow into the fruit causing a substantial loss of tomato production in protected and open fields (Salvo and Valladares, 2007). Spreading of T. absoluta across the Mediterranean basin has taken place primarily through tomato seed and fruit importation (Van Deventer, 2009). Besides, it has been demonstrated that the insect can cross few kilometers by flying and by being carried by the wind (Van Deventer, 2009). In Tunisia, TLM was detected for the first time in October 2008 on tomato crop in the region of Akkouda, during phytosanitary inspections (EPPO, 2008). Since, it has been spreading to all regions of Tunisia, to constitute today a significant threat to tomato crop. Therefore, it is essential to assess the genetic diversity and structure of populations of this invasive insect, in order to help efforts aiming to implement an efficient integrated management strategy. Randomly-Amplified Polymorphic DNA-Polymerase Chain Reaction (RAPD-PCR) markers (Williams et al., 1990) have been used in several studies to evaluate the genetic diversity of some major invasive species, such as the Citrus leaf miner Phyllocnistis citrella (Alvarez and Hoy, 2003), the Mediterranean fruit fly Ceratitis capitata (Haymer et al., 1997) and the potato white fly Bemisia tabaci (Hasan, 2006). In the present study, we have analyzed the genetic variability and population dynamics of T. absoluta populations from different regions in Tunisia, using RAPD-PCR, in order to offer insights into mechanisms of invasion and reveal the characteristics that determine invasion success. 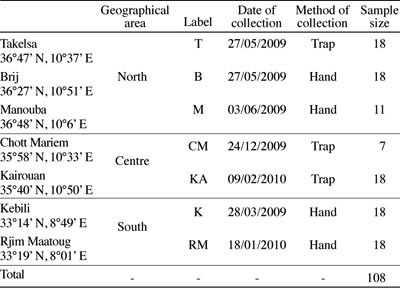 Samples of T. absoluta were collected during the years 2009 and 2010 by using plastic delta traps Kit AA (Profert, Algeria), to trap adult insect individuals or by hand removing of larvae from tomato leaves. We prospected seven sites in Tunisia (Table 1). The collection process was carried out under greenhouses or in open fields. Table 1. Tuta absoluta sampling data. Genomic DNA was isolated from each TLM individual (larva or adult), following the protocol of Doyle and Doyle (1987). Each sample was crushed in 300 μL of pre-warmed (65 °C) extraction buffer (1 M Tris-HCl pH 8, 5 M NaCl, 0.5 M EDTA, 5% cetyltrimethylammonium bromide). Samples were then incubated at 65 °C for 1 h. An equal volume of chloroform: isoamylic alcohol (24:1) was then added. The mixture was centrifuged at 8000 rpm for 10 min and the upper supernatant phase collected in a new tube. The DNA was precipitated with 2/3 volumes of ice-cold isopropanol. After a centrifugation during 15 min at 13 500 rpm, the DNA pellet was washed with 70% ethanol then dried. The DNA was dissolved into 50 μL of sterile bidistilled water. Five oligonucleotides provided by Operon Technologies (Alameda, California, USA) were used as primers (Table 2). RAPD-PCR reactions were performed in a total reaction volume of 25 μL containing 50 ng of genomic DNA (2 μL), 10 μM of a single primer, 10 mM of each dNTP (dATP, dGTP, dTTP, and dCTP), 25 mM of MgCl2, 5X PCR buffer (Promega, USA) and 5 U of Taq DNA Polymerase (GoTaq, Promega, USA). The reactions were carried out in a 2720 thermocycler (Applied Biosystems, Carlsbad, California, USA), programmed as follows: an initial denaturation step at 94 °C for 5 min, followed by 35 cycles each one consisting of a denaturation step (1 min at 94 °C), an annealing step (1 min at 36 °C) and an extension step (1 min at 72 °C); and finally an additional extension at 72 °C for 10 min. All amplifications were conducted twice to check for their reproducibility. RAPD-PCR products were subjected to electrophoresis during 3 h on 1.5% agarose gels, in Tris-Borate-EDTA buffer, with a voltage of 70 V and visualized under UV light, after staining in 0.5 |ig mL ethidium bromide. A molecular weight marker (100 bp Ladder, Invitrogen, Carlsbad, California, USA) was used as a standard. Table 2. Total number of randomly amplified polymorphic DNA (RAPD) fragments (N), number (P) and percentage (%P) of polymorphic fragments generated by five RAPD primers. The revealed RAPD markers were transformed into a binary matrix, where the presence of a fragment was coded 1 and its absence coded 0. This matrix was submitted to ARLEQUIN software version 3.11 (Excoffier et al., 2005) for statistical analyses. Molecular variance (AMOVA) was determined to describe the distribution of the genetic variability between defined groups (Fct), between populations inside every group (Fsc) and between all populations (Fst). The significance level of variance components was computed by non parametric permutation procedures. To estimate the genetic differentiation between the analyzed populations, Fst pair wise genetic distances were calculated and their levels of significance were also tested by a permutation procedure. The Euclidean distances between the seven populations were then presented in a two-dimensional scaling plot using the multidimensional scaling (MDS) procedure (Kruskal, 1964). All amplification products obtained were reproducible. For the 108 TLM individuals, 145 DNA markers were obtained with the five primers used. Product sizes ranged from 100 to 2072 bp. The percentage of polymorphic RAPD fragments generated by each primer alone varied from 75% with primer OP-D13 to 100% with primers OP-A8, OP-A17, and OP-D12, with an overall percentage of 96.55% (Table 2). Different RAPD phenotypes were recorded within each of the seven studied populations of T. absoluta. The number of RAPD phenotypes found in each population is given in Table 3. The level of polymorphism varied from one RAPD primer to another and from a population to another. 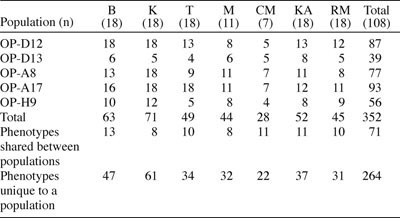 For example, in Kebili was the highest number of different RAPD phenotypes (71) revealed by the five primers, followed by Brij (63) and Kairouan (52); whereas only 28 different phenotypes were recorded in Chott Mariem most likely because of the restricted number of individuals analyzed (7). Out of the 335 phenotypes generated, 78.8% of them were specific to population and 21.2% shared by two or more locations. Table 3. Randomly amplified polymorphic DNA (RAPD) phenotypes generated by RAPD-polymerase chain reaction (PCR) amplification of DNA from 108 Tuta absoluta insects collected from seven populations in Tunisia. KA: Kairouan; RM: Rjim Maatoug. AMOVA analysis obtained from the distance matrix enabled a partitioning of the overall RAPD variation within and between populations. Three groups of populations were defined according to the geographical zones; North (Takelsa, Brij, and Manouba); Center (Kairouan and Chott Mariem) and South (Kebili and Rjim Maatoug). Results from AMOVA (Table 4) did not reveal any significant differences between these three groups (P = 0.17). In contrast, AMOVA showed significant genetic differences (P < 0.01) among populations and among individuals. Estimation of genetic variability by AMOVA revealed that 71.85% of total variation was found between individuals within each population and 25.19% of differences among populations. Table 4. Analysis of molecular variance (AMOVA) results for Tuta absoluta randomly amplified polymorphic DNA (RAPD) data. The genetic distances Fst between pairs of populations were significant; thus, it is possible to consider each population clearly differentiated. The level of genetic distance varied from 0.180 between Kebili and Takelsa to 0.437 between Manouba and Chott Mariem (Table 5). Furthermore, the geographically closest populations (e.g. Takelsa and Brij; Takelsa and Manouba) did not have a high genetic similarity. The MDS plot (Figure 1) did not show any grouping of T. absoluta individuals according to a spatial criterion, suggesting that the genetic diversity is associated with a significant gene flow between populations. Table 5. Matrixes of physical distances (km) and Fst genetic distances (based on 145 randomly amplified polymorphic DNA markers), between seven Tuta absoluta populations. RM: Rjim Maatoug. *Significant at P < 0.05. Figure 1. Bidimensional scaling scatter plot showing genetic relationships between seven Tuta absoluta populations based on 145 randomly amplified polymorphic DNA (RAPD) markers. The high percentage of polymorphic RAPD fragments (96.55%), number of RAPD phenotypes (335) and percentage of RAPD phenotypes specific to one population (78.80%), detected in the present study, are generally expected for insect species that reproduce sexually and have broad ecological niches and a wide geographical distribution (James et al., 1999). The estimates of genetic differentiation obtained by AMOVA analysis, demonstrated that the greatest portion of the total genetic variation was attributed to differences within populations. Indeed, sexual recombination events may play a major role inside each population, due to the short developmental time and high fecundity of T. absoluta (Vorwerk and Forneck, 2007). The absence of a significant differentiation between TLM populations from the north, those from the centre and those from the south of Tunisia through MDS indicates substantial amounts of gene flow occurring between these populations. Specific RAPD phenotypes were identified for individuals from each collection site, but overlapping phenotypes were also found, indicating that the migration of genotypes over long distances exists and most likely occurs through infested plants carried, between sites, by humans. The significant differences among and within populations could be explained by Bohonak et al. (2001) hypothesis, which ascribed the high level of genetic variation in invasive species to the introduction of different founder genotypes into the receiving population, together with sexual recombination events. So, it is possible that the genetic differentiation detected here may have come from two or more TLM populations introduced into Tunisia, simultaneously or at different times. Consequently, the introduced genetic variation would have been packaged into diverse genotypes, which may then have been recombined by human-influenced dispersal. As monitored in this study, there is a significant potential for adaptation behind the high genetic diversity of T. absoluta in Tunisia, allowing genotypes of this invasive insect species to quickly adapt to new environmental conditions. The results obtained in this work show clear genetic differences, which could be considered in the development of control strategies. Thereby, because of the high economic impact of TLM on tomato production, genetic monitoring efforts should be continued, in parallel with eradication measures and also restrictions on the export of fruits produced in infested regions. The authors gratefully recognize funding support from the Tunisian Ministry of Higher Education and Scientific Research.